Sweet Tea Sangria was written in partnership with Feast Magazine. SWEET TEA SANGRIA is a sweet and refreshing summertime drink! 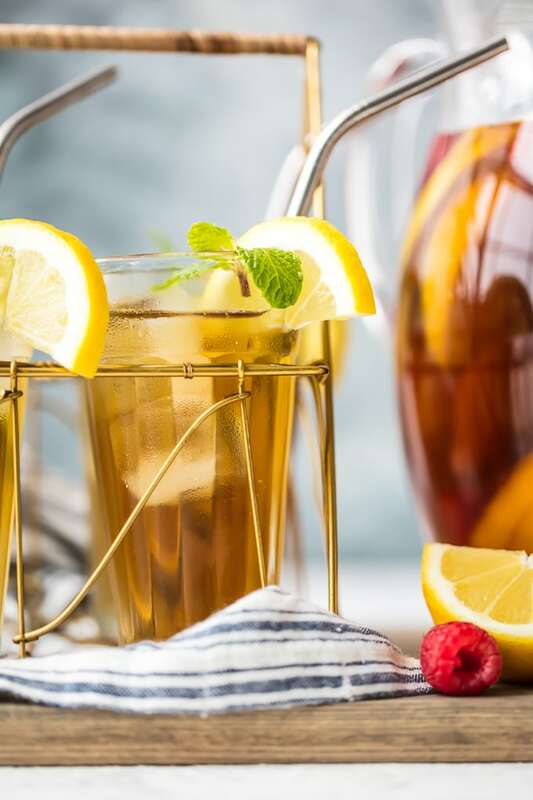 Sweet Iced Tea is a classic Southern refreshment to keep you cool in the heat, so it’s the perfect thing to mix with Sangria. 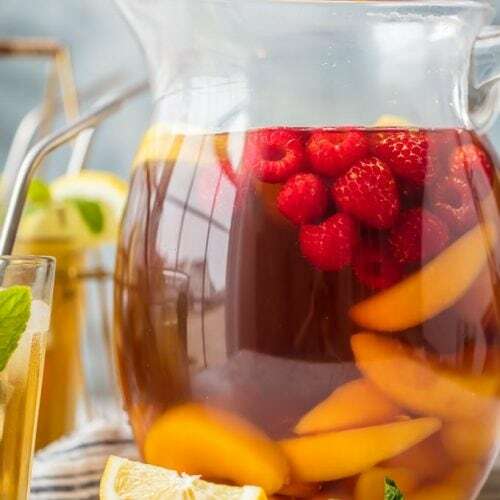 This Moscato Sangria recipe has a white wine base to complement the fresh and fruity flavors (raspberry, lemon, peaches, mint). Make a pitcher of this white wine sangria for your next summer party. Sweet Tea Sangria is super refreshing and full of flavor. Make this Moscato Sangria recipe for your next summer get together! Moscato Sangria is sweet, light, and refreshing. And that’s exactly the kind of drink I like during the hot summer months! 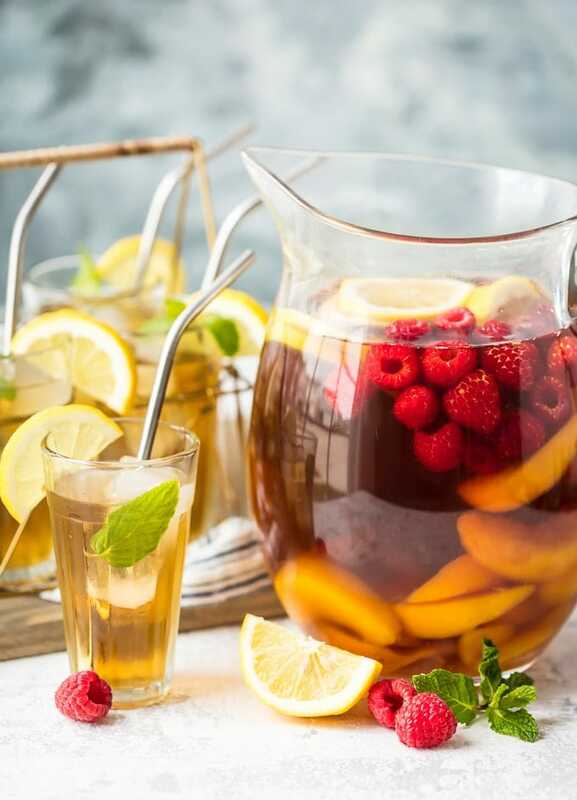 This Sweet Tea Sangria is the most delicious mix of of classic Southern Sweet Iced Tea, Moscato, and tons of fresh fruit. If you like sweet drinks, then you’ll definitely LOVE this recipe. I have so many Sangria recipes here on The Cookie Rookie. It’s one of my favorite drinks because…well, it’s wine. Wine mixed with whatever other fruit and flavor I want. A few of my favorites are the Apple Pie Sangria, Pink Champagne Sangria, and Meyer Lemon Citrus Sangria. But I can never have enough Sangria, this white wine sangria recipe is the perfect addition! Prepare some of this sweet moscato sangria to get through those warm summer evenings. Sweet Tea Sangria is the perfect blend of sweet iced tea and white wine. You’re going to love this light and fruity Moscato Sangria recipe! Traditional Spanish Sangria is made with dry, red wine, so you might be used to seeing dark red Sangrias. But something I love about Sangria is the ability to get creative and change things up. There is no right or wrong way to make it (as long as there’s wine!). This Moscato Sangria is so light and refreshing! 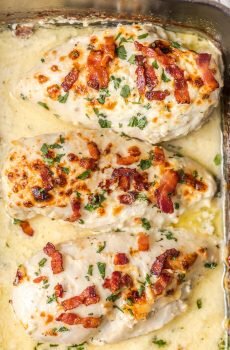 You can use any kind of white wine, but I prefer Moscato for this recipe because it already tastes sweet and juicy on its own. 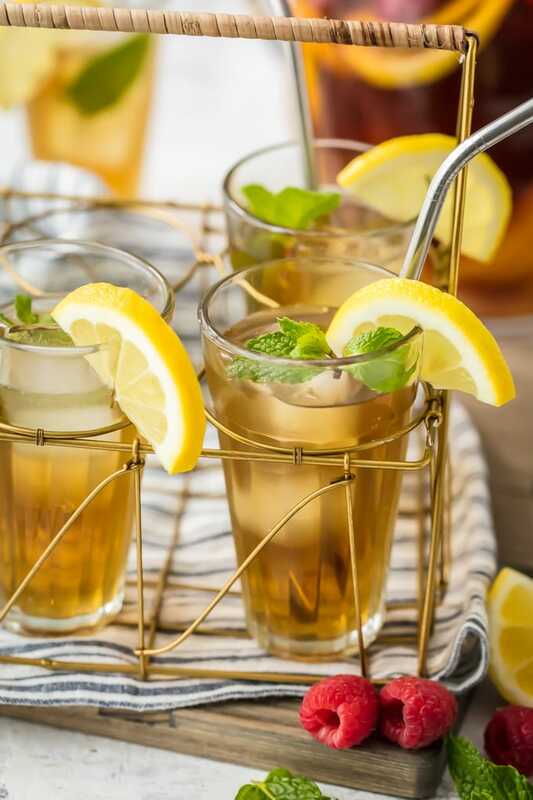 Mix that with some delicious sweet tea and lots of fresh fruit (and just a hint of Triple Sec for an extra kick), serve over ice, and you’ve got one seriously perfect summer drink. What’s in Sweet Tea Sangria? I love drink recipes like this because every single ingredient makes me think of sweet, sweet summer. Everything is light, juicy, and fresh. Doesn’t this Moscato Sangria sound like the perfect way to cool off? How do you make sangria with white wine? Sangria can be made with any wine, really. We’re using Moscato in this recipe and I think it’s the perfect pick for Sweet Tea Sangria. Just mix together the Moscato, sweet tea, and Triple sec, stir in the fruit, and chill in the refrigerator. Pour this white whine sangria over ice, garnish with a bit of mint, and serve to your guests (or just to yourself) all summer long. White Wine Sangria should last in the refrigerator for up to 3 days. The fruit will go bad before the wine does, so it’s best to drink it up quickly. 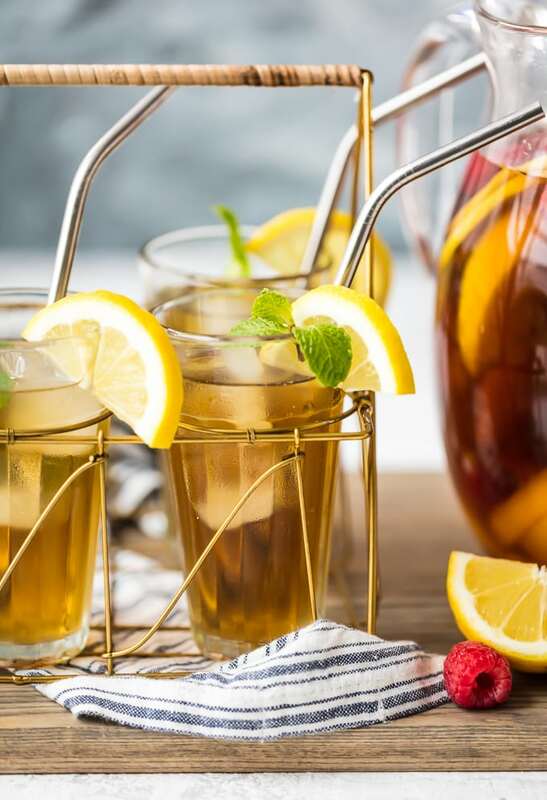 This Sweet Tea Sangria recipe is definitely sweet! 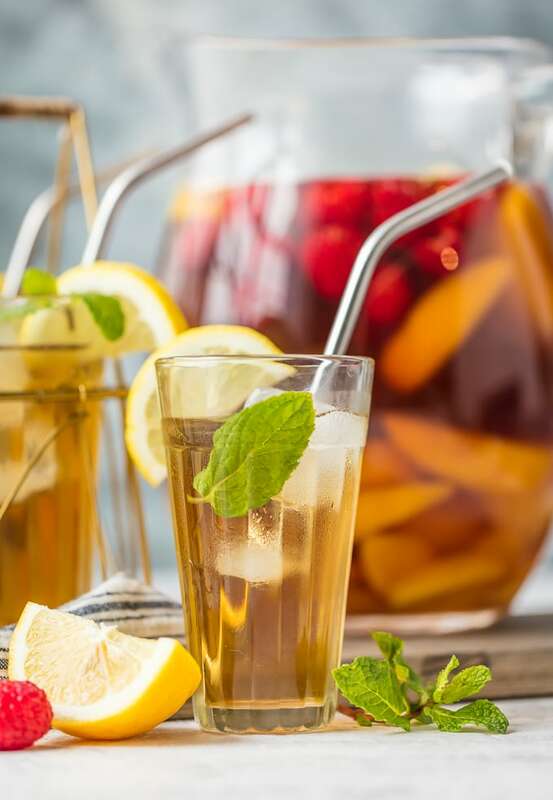 Traditional Sangria uses added sugar, but between the sweet iced tea, the Moscato, and the abundance of fruit, this beverage already has plenty of it. That being said, it’s not overdone, and I love having something sweet to sip on when it’s warm outside. **If you prefer your Sweet Tea Sangria not quite so sweet, you can use a Riesling or Pinot Grigio in place of the Moscato. If you need a refreshing beverage for a party this summer, this Sweet Moscato Sangria is the recipe for you! Light, fruity, and full of flavor. I hope you love it as much as I do. See the recipe card below for full details on how to make Sweet Tea Sangria. Enjoy! SWEET TEA SANGRIA is a sweet and refreshing summertime drink! 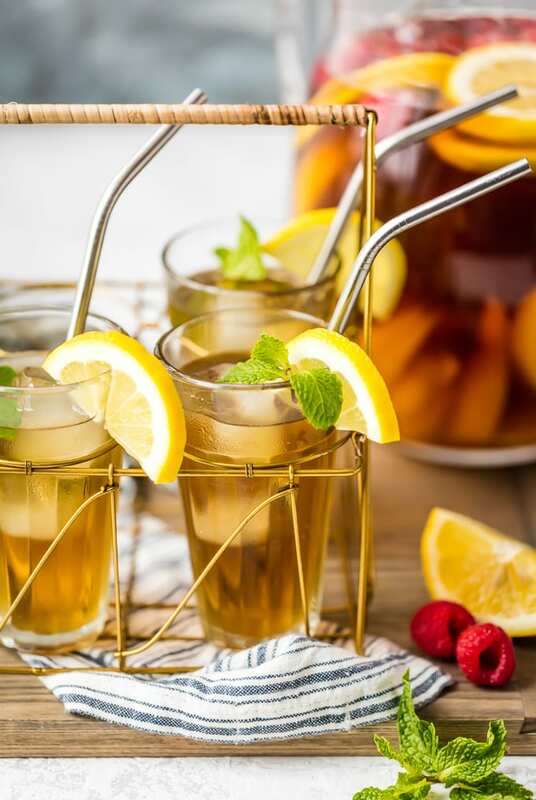 Sweet Iced Tea is a classic Southern refreshment to keep you cool in the heat, so it's the perfect thing to mix with Sangria. 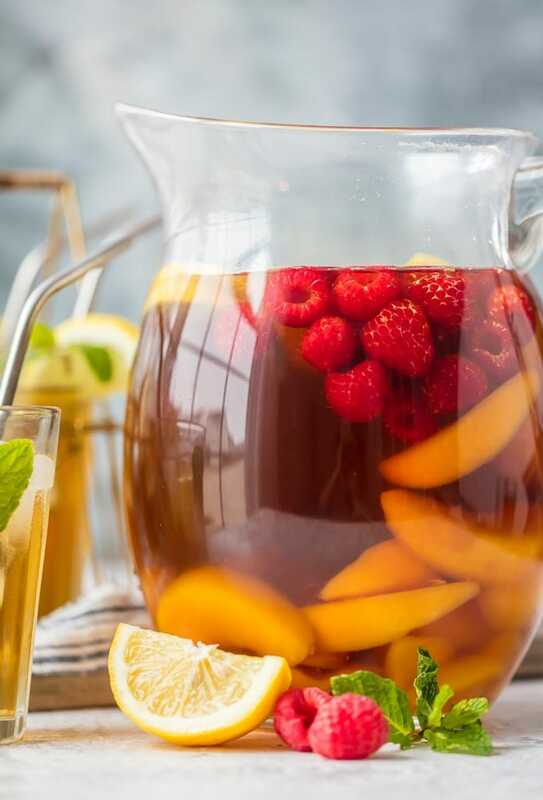 This Moscato Sangria recipe has a white wine base to complement the fresh and fruity flavors (raspberry, lemon, peaches, mint). Make a pitcher of this white wine sangria for your next summer party. In a large pitcher, stir together the wine, tea, and triple sec. Stir in the fruit. Store in the fridge for a minimum of 2 hours. When ready to serve, stir once more and pour over ice. Garnish with fruit and fresh mint. **If you prefer your Sweet Tea Sangria not quite so sweet, you can use a Riesling or Pinot Grigio in place of the Moscato.